If you’ve ever broken an arm or a leg, you know what it means to have an itch that you can’t scratch. Your doctor put your injured limb in a cast, limiting its mobility and rendering it inaccessible to comforting fingertips. At NXP, we have customers that feel the same way. They want many high-performance CPUs, 100Gbps networking, and modern I/O but are constrained by cost, power consumption, and form factor. A server-derived processor solution might have the right performance but not fit within these constraints. A multicore communication processor might have the requisite power and integration but not enough general-purpose processing horsepower or the right software ecosystem. They can now scratch that itch. 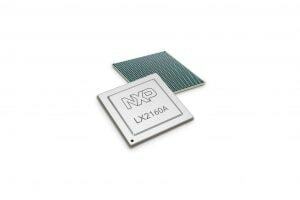 NXP just unveiled the QorIQ Layerscape LX2160A system on chip. We have taken the winning combination of 64-bit Arm CPUs, Ethernet and PCI interfaces, and network accelerators found in other Layerscape processors and scaled up everything. The LX2160A, for example, has twice as many Arm® CPUs as its LS2088A stablemate and nearly twice the IPSec performance of the 24-thread QorIQ T4240 processor. Best of all, the LX2160A processor will not cost an arm or leg—power consumption and price will be comparable to other QorIQ solutions. The CPUs are Arm’s powerful Cortex-A72 cores running at up to 2.2GHz. NXP has found that, in standard benchmarks, these CPUs are as fast as a single thread of a competitors’ server-derived processor and leave the wimpy cores in other competitors many-core designs in the dust. To scale performance, the LX2160A instantiates 16 of these cores. Helping to keep down the cost of the memory hierarchy, the LX2160A integrates 16MB of cache and has only two DRAM controllers. NXP selected this cache size based on analysis of packet-storage requirements of networking workloads. Being a multicore communication processor, data-plane performance is paramount. The LX2160A SoC integrates a 130Gbps Layer 2 switch, 100Gbps of compression acceleration, and 50Gbps of crypto acceleration. To align with cloud service providers and OEMs developing the next generation of equipment, NXP made sure the LX2160A supports the newest Ethernet interface speeds: 100Gbps, 50Gbps, 25Gbps, and 2.5Gbps in addition to legacy 40Gbps, 10Gbps, and 1Gbps rates. The PCIe ports are also up to date, supporting Gen 4 of the standard (16Gbps per lane) and ports as wide as x8. The LX2160A SoC is birthed into a rich ecosystem that includes standard distributions like Ubuntu and Debian. After all, there’s no point to giving system designers a processor with top-notch performance without also giving them a top-notch ecosystem. NXP is at the forefront of applying to embedded software development the community-style methods for building and updating open-source software popularized in the computing domain. System designers can now install application binaries from standard distros, easily integrate individual components of NXP’s SDK into their own distribution, and find NXP’s components within community distributions because of the company’s effort to upstream software. NXP also supports standard APIs for virtualization and NFV, including DPDK to accelerate network functions, OVS for virtual switching, and Virtio for virtualizing device drivers. The LX2160A additionally will be capable of running major SDN, NFV, and virtualization open-source software including Open Daylight, OpenStack, and OP-NFV. 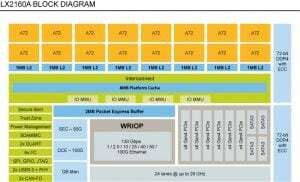 NXP Arm processors incorporate hardware for virtualization technologies such as KVM, Linux containers, and NFV and SDN. We foresee NFV, other virtualization applications, and edge computing to be the major adoption drivers of the LX2160A, especially because existing applications built to run on smaller Layerscape devices can be easily brought over to the LX2160A platform. Whereas those devices are mostly found in customer premise equipment, the LX2160A will find homes in beefier edge computing nodes, such as high-end enterprise routers, central offices, storage infrastructure and base stations. In conclusion, the Layerscape LX2160A processor is an excellent choice for hosting networking workloads, including NFV, and other edge computing applications, owing to the SoC’s 16 Arm cores, large caches, up-to-date interfaces, and 100Gbps networking. Moreover, a rich software ecosystem complements the processor and includes standard Linux distributions and software for SDN and NFV. The processor is also a smooth upgrade path for any embedded-processor customer seeking greater CPU performance, 100Gbps networking, 25Gbps/100Gbps Ethernet, and PCIe Gen4. For more information, please contact your local sales representative.